Now, I am no stranger to the excellence that is (are?) ikat nails.. but.. I happened to be reading Kayla's blog yesterday (congrats on the wedding.. if you ever happen to read this!) and I stumbled to her tutorials section. 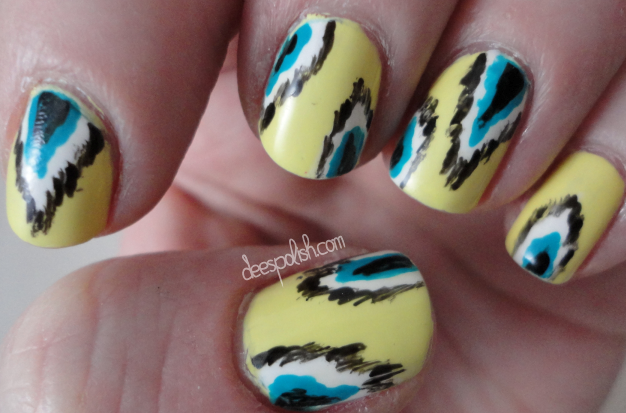 I hadn't decided on how I should do my nails.. and then saw the ikat tutorial. I know how to do them, BUT, the colours she had used for her tutorial instantly clicked with my brain and it was basically a done deal. Scope her rad tutorial HERE. I used Lime Crime Crema De Limon as my base colour (yellow), butter London Slapper (teal), China Glaze Liquid Leather (black), and China Glaze White on White. I also used my trusty little nail art brush and topped it all off with some Seche Vite. I started a new job, and am absolutely loving it. Also, added to the fact that it is great, some of the gals in the office are also in to nail polish! Finally people who don't look at you like you're super crazy when you exclaim that you love nail polish. It is really nice. One of the girls also inspired a polish purchase the other day. I will do a comparison post at some point. It is basically what I wanted one polish to be - but it is even better. Vague statement is vague. My life is getting back on track. New job, new place, school is going well.. I figure I can add back my love affair with the polish world again. Expect more from me.. I should be back to regular programming reeeeeal soon. I have missed it. Take care until next time..
Grey, Black, White, and Pink.. oh.. my?